The Dish Bistro is the restaurant side of two businesses that run side by side, the other side being a catering company called The Runaway Spoon. Cute names, huh? I’ve eaten their catering before but their restaurant is one of those places that I keep meaning to go to but never got around to a visit. So one weekend, while trying to think of a simple but tasty place for lunch near downtown, I decided to try and snag a table at The Dish. The place is on the small side but is bright and sunny thanks to large windows. The place was pretty busy even though it was already past 1 p.m., and my dining companion and I were lucky to find a table. Service was attentive. 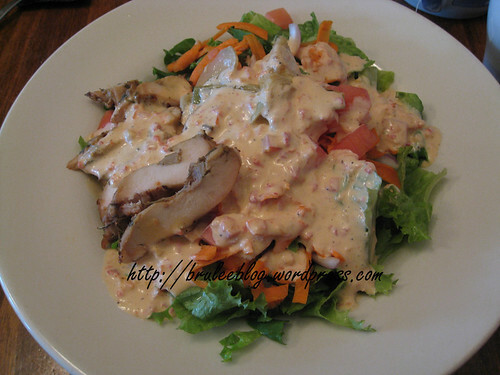 My order was the Dijon Chicken on Greens – a Dijon marinated breast of chicken served on a salad made up of mixed greens, tomatoes, carrots, Spanish onions and artichoke hearts, and topped with a roasted red pepper dressing. Visually the salad looks kind of messy but the meal was quite tasty. I also wished there had been more artichoke hearts, as I think I found only one that was chopped up into a couple of pieces. 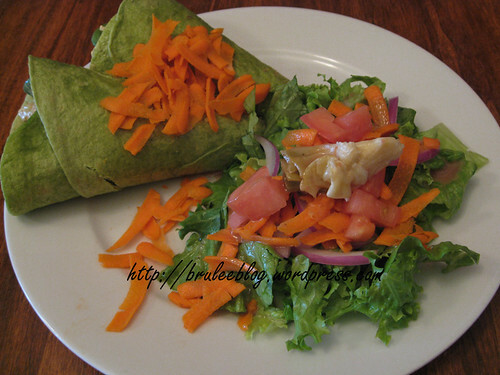 The person with me ordered the Mango Curry Chicken Wrap, which was filled with grilled chicken and a curried mango chutney and vegetables, and served with a side salad of Honey Greens (same salad as above, but without the chicken and with a red wine honey vinaigrette instead of the other dressing). I think the salad serving could have been a little more generous, but the mango and curry chicken mixture was delicious. This was the perfect light lunch that we had been looking for. They’ve got some great hearty looking dishes too, and I look forward to going back and sampling them. The Dish also has a great gluten free menu, with gluten free bread! People can ask for it when they come in.